GOOD NEWS DOESN'T TRAVEL FAST... The Committee passed a 'secret' resolution at their meeting in February this year and kept it hidden from fellow Committee Member, Dorothy Newbury, for two months. But what - and why? All was revealed at the AGM on Tuesday 13th May when Andrew Selkirk, who chaired the Meeting, announced that Dorothy Newbury had been appointed as a HADAS Vice-President. This gesture of appreciation for her prolific contribution to the administration of the Society is long overdue. Dorothy says "how unexpected it was and how much I appreciate the thought behind it, and my apologies for not acknowledging the honour when it was announced at the AGM". No problem Dorothy, the honour is all ours! HADAS Chairman, Andrew Selkirk, has this month been appointed Vice-President of the Royal Archaeological Institute. The Institute, founded in 1844, has some 1500 members and aims to assist in the preservation and conservation of national antiquities, offering research grants, keeping in contact with local societies, and publishing The Archaeological Journal. Congratulations, Andrew! WE sadly record the death of Paul Beevor at the Royal Marsden hospital last month. Paul, who was only 35, was a long-standing member, having joined HADAS as a 12-year old during our excavation behind the Town Hall at Hendon. His Mother and Aunt are members and our sympathy goes to them both. Just too late for the last Newsletter the Hendon Times reported plans for a massive expansion of the RAF Museum including the rescue of the Grahame-White hangar and the construction of a new aircraft display hall. I did not have time to inspect the plans before the next issue of the Hendon Times appeared. This gave a more complete picture. The Ministry of Defence is negotiating the sale of the East Camp to developers, the Mercury Group, including the listed factory buildings and the control tower but not the Grahame-White hangar which would be moved to a site nearer the RAF Museum. The Mercury Group's plans for the site include a leisure complex with a cinema, health and fitness centre, bingo club, bowling, restaurants, a theme pub, an MOT driving test centre, an `autopark' with up to ten motor dealerships and other facilities. It does not sound so very different from some earlier plans for an `autopark', and other facilities. English Heritage has said it will support the plans provided the hangar is moved in an "acceptable manner" and the other listed buildings are repaired. A number of development schemes along these lines have been proposed over the years. It will be interesting to see what comes of the latest plans. Perhaps we have come far enough out of recession for redevelopment at Hendon Aerodrome, with preservation of the historic buildings, to become a reality at last. We must wait and see. connection to Hendon although, as Bill pointed out, flying in the area can be traced back to August 1862 when a hot air balloon landed in fields, possibly on the later aerodrome site. Later in the 19th century there were balloon ascents from the Welsh Harp pleasure grounds which attracted a rather rowdy element to the proceedings. Another venture was the aeroplane built in the ballroom of the Old Welsh Harp pub. This plane, which never flew, was built by H P Martin and G H Handasyde, who three years later formed the successful Martinsyde Aeroplane Company at Brooklands, employing Sydney Camm, later designer of, that Battle of Britain stalwart, the Hawker Hurricane fighter. In 1909 E J Everett, director of a local firm of instrument makers built a single seat monoplane in a shed at the edge of what was to become the Hendon airfield. His `Grasshopper' or 'Hedge Hopper' taxied but never flew, although a model made from drawings of the original, with an improved power/weight ratio, did later fly. Grahame-White first flew from Hendon in January 1910 and took out an option to purchase 207 acres of pasture between Colindale and Hendon as an aerodrome, purchasing it at the end of the year. He was born in 1879 near Southampton, the third child of a local businessman; at sixteen he became an apprentice with a Bedford engineering company and in his spare time was soon running his own bicycle factory and established his own automobile business in 1901. He took up ballooning but was frustrated by its lack of directional control. All this happening as powered flight developed. As Bill commented, 'Who invented the first aircraft that would not fly? - The Wrong Brothers!'. In 1910 he was awarded Aero Club de France certificate No 30 as the first internationally recognised British pilot. In 1911 he formed the Grahame-White Aviation Company which set about turning the leased 207 acres into an airfield - the 'London Aerodrome' with its flying schools and aircraft factory producing Grahame-White machines. The Great War was a busy time, with the airfield served by its own branchline and sidings connected to the Midland main line near Silkstream Junction; some 8,000 aircraft were produced at factories surrounding the aerodrome from a wartime British total of 55,000. The post-war years were difficult for Grahame-White with aircraft contracts cut overnight following the armistice, with no compensation for materials already purchased and the Grahame-White factory surviving by using wartime timber stocks to build car bodies and furniture. A long-running campaign for compensation from the Government, following their requisition of the airfield, was finally settled in 1925 for some half million pounds. An embittered Grahame-White emigrated and concentrated on property investments, dying in August 1959, having served as a firewatcher in WWII. He was ahead of his time and possibly trod on the toes of too many politicians to get a fair deal. As a curator of the RAF Museum myself, I enjoyed Bill's photos of the last days of the former East Camp side of the Hendon airfield, closed to flying since 1957 and now largely covered by the Grahame Park Estate. Development proposals for the East Camp land have been less than successful to date and its few remaining buildings are derelict, with the exception of the former Officers' Mess which is now part of the Middlesex University's student accommodation. 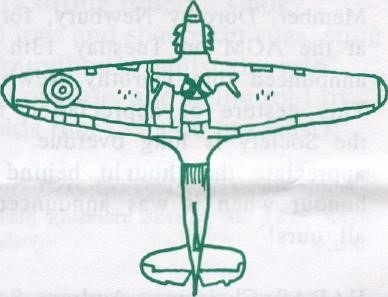 An excellent lecture that brought numerous questions at the end and I would recommend David Oliver's paperback 'Hendon Aerodrome - A History' (Airlife 1994) to those seeking more detail. There were a few unanswered questions after my lecture for which I now have answers. FIRST - "Hangar" - I remembered this on the way home! Hangar is a French word for a shed and since aviation in Europe developed in France, the English at least, adopted the French word. The full French term was 'hangar aux avions' to distinguish an aeroplane shed from other large sheds but the 'aux avions' was soon dropped. The word actually derives from the medieval Latin `angarium' - an agricultural shed or barn. SECONDLY - Flying Fortresses at Hendon. Flying Fortresses were never based at Hendon which was far too small for them but several battle-damaged B-17 Fortresses and B-24 Liberators of the USAAF made emergency landings at Hendon in 1944 when returning from bombing raids. THIRDLY - Last Flights The last official day of flying at RAF Hendon was 4 November 1957. However, in January 1959 No 617 Gliding School was based at Hendon and continued glider flights until March 1968. In the meantime helicopters used Hendon (as they still do) and occasionally powered fixed wing aircraft landed with by special permission or in emergency and, once or twice, by mistake for Northolt. The very last aircraft at RAF Hendon was a helicopter on 1 April 1987 which flew in for the closure ceremony. There is currently an eight-year waiting list for those wishing to join the £800pa Garrick Club. Membership is restricted to gentlemen only, who must be good conversationalists with an interest in the arts. Actors are especially welcome. HADAS members, thanks to Mary O'Connell, however, did not have to wait that long nor pay such a large sum to spend a morning at this pillar of London's clubland. The Garrick was founded in 1831, some fifty years after the death of David Garrick after whom it was named. The Duke of Sussex, its founder, wished to establish a club where actors and men of refinement might meet on equal terms. A club which was 'noisy' hence the desire for good conversationalists. The first meeting was at the Drury Lane Theatre, subsequently at premises in King Street and finally at the purpose-built Garrick Street premises from 1864. The street, incidentally, was named after the club. The Club is a veritable art gallery dedicated to the theatre. A founder member, Charles Matthews, was an avid collector of theatrical portraits. His collection was purchased after his death by Robert Durrant, Trustee of the Club, who presented them to the Garrick. This collection has been added to, principally by donations, so we were able to recognise portraits of actors of our own lifetime amongst the 1,000 or so paintings as well as those of the great names from theatre history. Our first sight of these treasures was in the Coffee Room which is the focal point of the Club. The long table is for members only and it is a rule that members must sit next to an occupied seat - no gaps are to be left. This is to encourage conversation. The table has been designed especially narrow to facilitate cross-table discussion. The paintings here include those of Garrick, in costume, showing the extravagant gestures of his then revolutionary acting style. We saw Mrs Siddpns as Lady Macbeth and Mrs Garrick who outlived her husband by forty years. They had no issue but this apparently does not deter visitors to the Club claiming to be descendants! The Irving Room is dominated by a typical David Roberts painting on a classical theme which, unfortunately, is too large to be removed through the renovated kitchens. The key portrait in the room is, of course, Sir Henry Irving (1838 to 1905) showing off his distinctive profile. Surprisingly, his first application for membership was blackballed. Anthony Trollope (in a letter on display) suggested he stood again, this time with success. We then entered a rather hybrid room - the tablecloths were pink and white, even the chandeliers had pink shades. This was the Ladies' Lunch Room! It is actually called A A Milne's Room after his donation of 25% of Pooh royalties to the Club some 25 years ago. His donation funded urgent upgrading of the Club's facilities. Relics of Milne are few - a bear statuette and a small portrait of Christopher Robin. The landings on the stairs to the first floor are home to Garrick's chair and Henry Irving's chair 'where he breathed his last'. At the top of the stairs is a portrait of the Club's patron, the Duke of Edinburgh. The Cocktail Bar (reminiscent of those found in older theatres) had portraits of theatrical artists of more recent times - Olivier (wearing the Club tie of 'salmon and cucumber' stripes), Michael Hordern, Leslie Howard, Constance Cummings, Ben Travers, Sir John Gielgud (the only one actually purchased by the Club), Alistair Sim, Alec Guinness, Basil Dean and many others.The Morning Room, where we enjoyed coffee and biscuits, had unfortunately suffered water damage from leaks in the heating system and looked the worse for wear - paintings had been damaged, the walls looked very bare by comparison with the rest of the building.Stage memorabilia occupied several cases on the landing outside, including such items as the crown Donald Wolfitt wore as Lear.The first Constitution of the Club stated that a library should be formed from donated books, such donations to be noted on the members' list. It took three years for the library to actually get under way and until 1982 a guinea was deducted from the membership fee to fund acquisitions. Nowadays it is generally funded. Naturally, the theme is the theatre. Henry Irving donated Garrick's papers - the Club must have appreciated his eventual election to membership - a much valued research collection. Gems from the acquisitions include: Kemble's prompt books; 'The Era' (forerunner of 'The Stage') for 1859-1939; Drury Lane/Covent Garden playbills 1798-1859 and Noel Coward's visitors' books from three houses, Bona fide researchers can access this unique resource.These outings organised by Mary O'Connell let us access London's treasures. We know of the Garrick as a Club but, thanks to Mary, we are now aware of its history and the wealth of theatrical art and literature within its walls - and we can even recognise the Club tie! An item in the May edition of NOTTINGHAM UNIVERSITY's newsletter reports the publication of Wollaton Hall: an archaeological survey. This Nottingham Tudor great house was investigated by their Department of Archaeology who unravelled four centuries of building alterations, including cellars, water supplies and a Tudor sewer system. The survey sheds new light on original plans and impact of lifestyle on the accommodation. The house was designed by master mason Robert Smythson who later designed the re-build of Hardwick Hall for Bess, Countess of Hardwick. The Nottingham house brought no such fame to its owner Francis Willoughby who was financially ruined by the building of Wollaton, which he had hoped would elevate his social standing. Unfortunately for him Queen Elizabeth never slept there. This site lies on high ground over­looking the Dollis Valley and may have been little disturbed in the past, on topographic grounds English Heritage are asking for a watching brief here. HADAS conducted an excavation near this location finding a medieval ditch. Hadley Green Garage, Great North Road, This empty structure has been the subject of previous planning applications. It lies within the Battle of Barnet area, has been identified as the site of a medieval windmill and is near to an ancient boundary ditch to Enfield Chase which met the South Mimms boundary, known as Gannick Bank (J.Cobban). York: So, if the issue of the elder son Succeed before the younger, I am King. Warwick: What plain proceedings is more plain than this? AT LAST there are firm plans for a statue to commemorate the Battle of Barnet, 1471, one of the major conflicts of the Wars of the Roses. If we walk round the walls of York this September we shall pass a display about one of the battle's protagonists, the future Richard III and, on the opposite side of town, the Micklegate Museum where one can see a spike 'similar to that on which the Duke of York's head was displayed'. The power struggle between the royal houses of Lancaster and York and their Geographia of followers originated in 1399 when the son of John of Gaunt the last Duke of Lancaster deposed Richard II and was crowned Henry IV. He was succeeded by Henry V and then, in 1420, by eight-month-old Henry VI. Humphrey Duke of Gloucester, the baby's uncle, found his authority as Regent constantly challenged by his own uncles, the Earl of Somerset and the Bishop of Winchester, 'the Beauforts', sons of John of Gaunt but born many years before their parents married. The rivalry became permanent when Henry VI proved to be unworldly if not actually feeble-minded. England was badly governed, France was lost; the next Earl of Somerset was elevated to Duke and Humphrey died in disgrace, his wife accused of witchcraft. The second Duke of Somerset was a close friend of the Queen, Margaret of Anjou. There is no evidence that they were lovers but when, in 1455, Margaret was pregnant after ten years of marriage, Henry said it was the act of the Holy Ghost. He was so disoriented by this miracle that it was necessary to appoint another regent, so, Somerset keeping a low profile, the Council sent for the Duke of York who, for thirty-five years had been the unacknowledged heir to the throne. To understand the Duke's place in the Plantagenet family tree it is easiest to go back a century to Edward III whose large family included the Dukes of Clarence, Lancaster and York. Clarence left a daughter, Phillippa: Lancaster's legitimate son became Henry IV and York's younger son, the Earl of Cambridge, married cousin Phillippa' s granddaughter. She died in 1411 giving birth to a son whose distant connection with the more senior house of Clarence gave his father an excuse to plot against the Lancastrian King. Cambridge was executed by Henry V and the little orphan put in the Tower for safe keeping. He inherited the Dukedom of York when his uncle was killed at Agincourt and grew up to be a loyal Lancastrian, serving in France and then in Ireland. He had spent little time at the court he now ruled. Henry VI regained what there was of his wits and York returned to Ireland but the King became permanently incapacitated a few months later, after Margaret gave birth to Prince Edward of Lancaster. York was sent for again and tactlessly suggested that, all things considered, he might as well be king. By then the Earl of Warwick, the Duchess of York's nephew and grandson of a female Beaufort, had already fired the first shot in, what some Victorian was to dub, the Wars of the Roses. According to legend it was a lucky shot, bringing down the signboard of a St Albans' inn upon the head of the Duke of Somerset. He was replaced by the third Duke but not before Warwick had taken charge of the King and the country on behalf of York. HADAS member Rick Gibson wrote about the Golders Green clocktower in newsletter 289 (April '95). Last summer we noticed that the clock had, once again, came to a halt for several weeks. Rick explains "the electric motor that winds up the weights burnt out and it took Barnet Council a while to obtain a replacement". Rick's article mentioned two electric motors, fitted after the last war. Does this mean the other motor is due to burn out? Should we campaign for a millennium sundial? YES, I've found another excuse to write about trams in the HADAS Newsletter! Over the past three years or so the Middleton Press have been producing an excellent series of hardback books in their 'Tramway Classics' series covering the tramways of Southern England. Whilst some titles cover the former tramways of such towns as Southend, Portsmouth and Reading in a single volume, the tramways of London are being covered very comprehensively area by area; already some 18 volumes have been published on London alone, with more (including the Edgware Road routes) to come. Volumes of local interest already published include `Holborn and Finsbury Tramsways' covering Highgate Angel and Manor House routes (published 1996) and `Hampstead and Highgate Tramways' covering Chalk Farm, Hampstead, Parliament Hill Fields, Highgate Village and Archway Tavern and south to King's Cross. All of these volumes feature a short introductory piece of text, a very high pictorial content from 1900s-1950s, tramway rolling stock details, track plans, rules and regulations, timetable extracts and extracts from 1-2500 O.S. maps of the areas covered. Latest volume published is 'Barnet and Finchley Tramways' by Robert J Harley (April 1997, ISBN 1.873793 93 6) which follows the former Metropolitan Electric Tramsways route along the Great North Road from Highgate Archway Tavern, through East Finchley, North Finchley, Whetstone and High Barnet, plus the route to Golders Green via Church End the heart of HADAS territory! All this for £11.95. There are some splendid photos of the terminus at Barnet Hill with St John's Church prominent; of trams - and a trolleybus - under the railway bridge at the foot of Barnet Hill; street scenes in Whetstone; (there is a good balance of street scenes and rolling stock close-ups); Tally Ho Corner; the former tramway station at Kingsway; a lovely night-time shot of Finchley Tram Depots Ballards Lane, Church End, Golders Green East Finchley, and Highgate Archway, often of locations still recognizable today, sixty or more years after the trams (which finished in this area in 1938) ceased to run. For anyone with an interest in local history - not just transport - I would recommend this volume unreservedly. The City of London Archaeological Society found themselves in the news recently. Several COLAS members are taking part in the Thames Foreshore Project which held a Press/Open Day at Shadwell which was reported in the Daily Telegraph and the Guardian. Project Leader, Mike Webber, gave a talk to HADAS in April last year (reported In May 1996 newsletter). There will be another Open Day on Sunday 6 July to be held at Chiswick. If anyone would like to attend, they should contact the COLAS Chair/Field Officer, Rose Baillie on 0171-359 1774 (evenings). The next Barnet & District Local History Society lecture is by Jennie Lee Cobban (a HADAS member), entitled The Legend of Geoffrey de Mandeville. Date: Wed 11 June, 7.45 for 8pm. Venue: Wyburn Room, Wesley Hall, Stapylton Road, Barnet. (Confirmation of details from Barnet Museum on 0181-440 8066). Hampstead Garden Suburb weekend: 21/22 June - see local Press for details. HADAS will have a bookstall there - we need helpers to man (person??) the stall, please phone Roy Walker - 0181-361 1350. The current exhibition The Splendour of Heraldry , prepared by the Middlesex East Heraldry Group, explains origins and displays a variety of examples of insignia. There is a section on local families' coats of arms and, for the faithful, pub signs in the borough of Barnet. (Closing time is June 29th). Liz Holliday informs that a group of medieval archers, the Handown Mercenaries, will be visiting the museum on Sundays 22nd and 29th of June to display weapons, livery badges and an encampment showing 13/14th century campaign life. If you wish to check times, please phone the museum on 0181-203 0130. While you are there, watch out for Henry (Curator Gerard Roots' ginger torn) who prowls the garden area. He is famous for decimating the local squirrel population single-pawed and might not take kindly to a group of archers on 'his' hunting ground. Pusstols at dawn? Butser Ancient Farm - is once again running a season of 3- and 6-day residential courses on Roman Villa construction, pollens, experimental earthworks, and experimental archaeology. Also planned are one-day workshops on flint knapping, bow making and food in prehistory. The last course of the year is in November. Information from: Butser Ancient Farm, Nexus House, Gravel Hill, Waterlooville, Hampshire P08 OQE. Tel: 01705 598838. (A personal favourite memory of HADAS is our visit to Butser two years ago, with our members sitting round a smoky campfire on logs and sheepskin rugs, snug inside the roundhouse whilst the rain tipped down outside, and being told by Peter Reynolds that Celts do not exist).